Expedition 10 flight engineer Salizhan Sharipov ties the satellite NanoSputnik to the Pirs docking compartment exterior during his second spacewalk on March 28, 2005. He later deployed the small satellite by tossing it into space. Twoastronauts are safely back inside the International Space Station (ISS) after apparentlybreezing through an early morning spacewalk designed to prepare the orbitalfacility for a new cargo ship. ISSExpedition 10 commander Leroy Chiao and flight engineer Salizhan Sharipov leftthe space station empty as they worked outside clad in Russian-built Orlanspacesuits. The two menwere consistently ahead of schedule as they installed antennas and photographedthe space station, ultimately completing their tasks 4.5 hours after leavingthe Pirs docking compartment at 1:25:20 a.m. EST (0625:20 GMT). "Now thatwe have time to actually look around, it's too bad it's all dark outside," said Chiao as he prepared to reenter the ISS as it flew over an Earth draped in night. Chiao andSharipov worked primarily on the space station's Russian Zvezda service module,installing a trio of navigation antennas around its conical smaller section.The space-to-space antennas - known as WAL antennas - will be used to aid thedocking operations of Europe's Automated Transfer Vehicle (ATV) during futureISS-bound cargo mission. Anotherpiece of hardware - a global positioning system (GPS) unit attached to Zvezdaduring the spacewalk - will also aid the ATV, which NASA officials said isexpected to arrive at the ISS sometime next year. NASAofficials said the first ATV, called Jules Verne, will be able to deliver 8.5tons of cargo to the ISS, including some 10,000 pounds (4,535 kilograms) ofpropellant. In additionto installing the new antennas, the Expedition 10 crew also deployed a smallsatellite in what may be the ultimate Hail Mary pass. 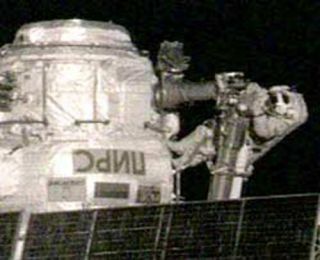 After the Expedition 10 crew successfully connected the first three antennas, Sharipov returned to the Pirs dockingcompartment, to which he had lashed the small satellite NanoSputnik. Weighingjust 11 pounds (five kilograms) and about one foot in length, thesatellite carries a transmitter and is designed to test small spacecraftcontrol and orientation systems over about 100 days in space. "Offit goes," Sharipov said as he threw the long nanosatellite into space at avelocity of about one meter (3.2 feet) per second. "It's rotating a bit,but it should be okay." Sharipov tossedNanoSputnik into a retrograde orbit - opposite the direction of the spacestation's motion - at about 3:31 a.m. EST (0831 GMT) while Chiao photographed thein-space launch. "Congratulationsand huge thank you to you because our scientists are saying they are getting asignal from the satellite," Russian flight controllers later toldSharipov. Before Chiaoand Sharipov could move back to the Zvezda module and install the GPS unit,Russian flight controllers had to take the space station's attitude controlthrusters - which help the ISS maintain its position - offline to avoid harmingor contaminating the spacewalking duo with toxic propellant. Instead,the space station's attitude was kept in check by U.S.-built gyroscopes. U.S. flight controllers had only anticipated the station's two working gyroscopes last about30 minutes, after which time the loads on the ISS would be too great and thestation would be left to drift while the Expedition 10 crew completed theirwork near the Russian thrusters. But NASAcommentators said the gyroscopes performed much longer than anticipated, andwere only overwhelmed at 5:15 a.m. EST (1015 GMT). The ISS drifted freely for lessthan an hour, a dramatic difference from the three hours expected by U.S. flight controllers. By 6:31a.m. EST (1131 GMT), Chiao and Sharipov had repressurized the Pirs dockingcompartment and doffed their space suits. The successful extravehicularactivity marked the sixth spacewalk for Chiao and the second for Sharipov. Togetherthey have amassed a total of nine hours and 58 minutes of spacewalk time duringthe two Expedition 10 spacewalks. Including today's event, ISS astronauts havespent 358 hours and 15 minutes working outside the space station. About 181hours of that time is spread across 33 spacewalks staged from the ISS itself,NASA officials said. TheExpedition 10 crew currently has less than a month of on-orbit mission timeremaining, with Chiao and Sharipov expecting to return to Earth on April 25.